In Copenhagen's school gardens, children are getting out of the classroom and growing vegetables in their own garden while learning about sustainability, ecology and health. 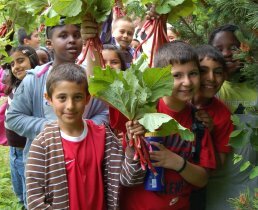 In Copenhagen Municipality, from April to harvest time, life flourishes in the six school gardens, which are tended by classes as part of the curriculum. The Association of Copenhagen School Gardens has a total of six gardens, where preschool and school children can get their hands dirty in the gardens, listen to birds singing and make bon res. Each child has its own little garden, with experienced gardeners teaching them about processes from seed to harvest, as well as sustainability, cooking and compost. Through learning by doing, the children learn how to behave respectfully in nature, as well as learning where food comes from. The children are taught about the diversity of animals and plants and their own role in the circle of life. The combination of physical work (spreading manure, sowing, pruning, feeding chickens, picking fruit) and teachers’ ability to link activities to the curriculum and theory of nature, environment and food, prove a highly potent learning cocktail. In 2018, 34 school classes have gardening on their timetable and a total of 3,000 children from schools, kindergartens and clubs participate in the projects. Even more school classes are waiting to take part in the initiative. To accommodate this demand, the city of Copenhagen is working together with the organizations Tagtomat and Kompostbudene to establish two additional school gardens. The school gardens in Copenhagen are approximately 50,000 m2 and allow children to learn in a concrete and meaningful way about gardening, nature and food. The school gardens are not self-sufficient, but they contribute to sustainable food production by bringing more of our production closer to where we live. The school gardens help to promote biodiversity in the city and provide access to green areas and nature, with space for play for the city's smallest citizens. The school gardens are organic and sustainable. Through the course, children are introduced to where produce comes from and how it makes its way from farm to fork.